Eezham Tamils in North and East observed a largely silent Chiththirai New Year this year as the uprooted people in Mannaar and Mullaiththeevu are on the streets waging continuous protests along with the kith and kin of those subjected to enforced disappearances at the hands of the occupying Sinhala military. 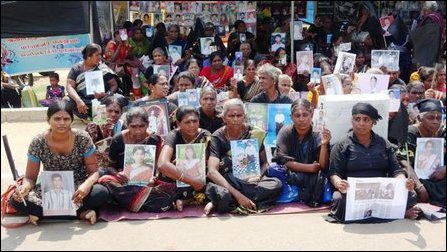 A protest march was staged in Vavuniyaa in support of the protest of the families of enforced disappeared. People wearing black armbands took part in the protest. 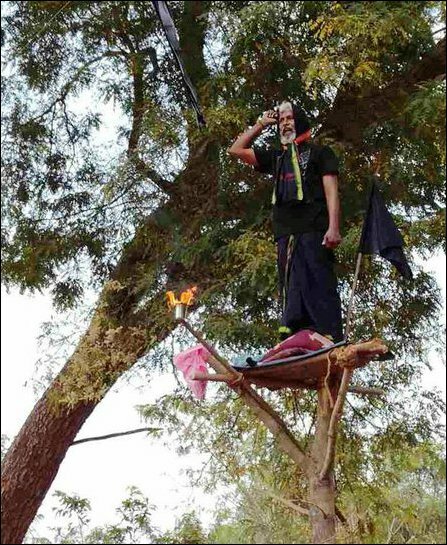 In the meantime, occupying SL military personnel wearing traditional Sinhala clothes attempted to ‘celebrate’ New Year with protesting people at Keappaa-pulavu. The protesting people declined the offer and firmly stated that they would only celebrate New Year after getting their village back. The protesters were flying black flags and continued their protests in black clothes. It became clear on Friday that the continuing protests across the districts have caused a huge impact in the minds of the people. 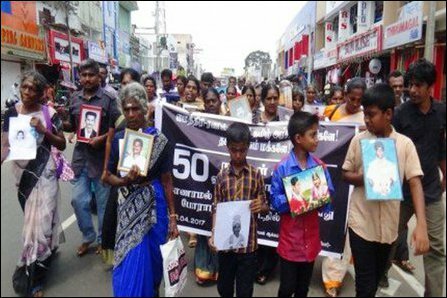 The protest in Vavuniyaa reached 50th day on Friday. 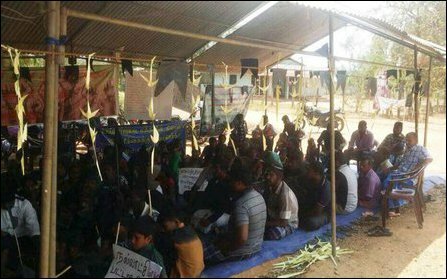 Both the uprooted people waging their protests at Keappaa-pulavu (Mullaiththeevu), Mu'l'lik-ku'lam (Mannaar) and at Pa'n'naa-ka'ndi (Ki'linochchi) were encouraged to see the increasing support of the people from of all walks of life. One could clearly see the divide among the people in the island on the New Year day with spectacular celebrations in the South. 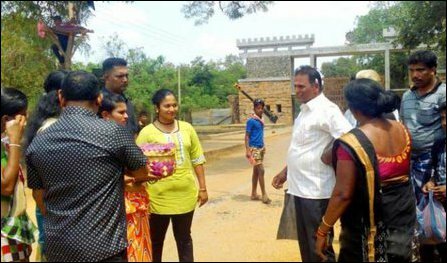 Sinhala soldiers in civil accompanied with their families visiting from South wanted to mark New Year with protesting Tamils outside their cantonment. The uprooted families politely declined the proposal for joint marking. 12.09.17 Alienate lands to Sinhala colonists or face transf..
06.09.17 Cooray emerges as ‘civil’ guardian of Sinhala colo..
24.08.17 NPC to lodge legal action against SL Forest Depart..
21.08.17 SL Forest Department at war with resettling Tamils..
11.08.17 SL Forest Department schemes Sinhala colonisation ..
27.05.17 Islamophobic monks from Myanmar visit genocidal Bu..
10.05.17 Sinhalicisation targets strategic Pulmoaddai, Musl..
01.05.17 Sinhala colonists in Kokku’laay violate interim or..
19.04.17 Countries backing Colombo in UNHRC complicit in ge..
18.04.17 Direct involvement of SL Fisheries Department in K..
15.04.17 People express solidarity with protests, low-key N..
11.04.17 UN, Western governments fund genocidal Sinhala mil..
06.04.17 Sinhala police attempts to evict Tamils from fishi..
05.04.17 SLAF hurriedly erects Buddhist Vihara in Keappaa-p..
01.04.17 Intruding Sinhala fishermen ridicule Tamil officia..
14.03.17 Colombo's structural genocide against Eezham Tamil..
11.03.17 Uprooted people of 5 coastal villages in Jaffna is..
07.03.17 Uprooted Tamils to launch mass struggle against SL..
01.03.17 Keappaa-pulavu struggle continues, only one tenth ..
24.02.17 Kaaththaankudi Muslims express solidarity with upr..
23.02.17 UN Human Rights mechanism in Geneva has disappoint..
20.02.17 Uprooted Keappaa-pulavu families inspire strugglin..
19.02.17 Keappaa-pulavu protesters question silence of fore..
18.02.17 UK, Australia, have responsibility in halting Mull..
17.02.17 SL military puts up shoot-at-sight warning inside ..
15.02.17 Kokku'laay Tamils face multi-pronged structural ge..
13.02.17 Displaced Muslim women from Puththa'lam express so..
11.02.17 Uprooted Keappaa-pulavu people continue protest fo..
06.02.17 Keappaa-pulavu protesters draw solidarity from Tam..
05.02.17 UN Human Rights Council misled on ground situation..
03.02.17 Uprooted families in PTK join de-militarisation st..
01.02.17 Uprooted Ezham Tamil women confront structural gen..
23.01.17 Structural genocide against Tamil fishermen reache..
20.01.17 Sinhala military suppresses protests in Vanni prio..
13.01.17 Sinhala colonists step up hate crimes against Tami..
05.01.17 Erection of Buddha statues in areas where no Buddh..
03.01.17 Overfishing by Sinhala intruders out of control, T..
02.01.17 Sirisena accelerates ‘Army and Archaeology’, Ampa'..
30.12.16 Unabated construction of Kokku’laay vihara in 2016..
24.12.16 Sinhala colonists issue death threat to Tamil, Mus..
21.12.16 Sinhala colonists harass Eezham Tamils, demand acc..
10.12.16 Maithiripala regime steps up Sinhalicisation of Va..
02.12.16 Tamil village confronting demographic genocide rem..
15.11.16 Demographic genocide escalates in Vanni, plans afo..
13.11.16 Sirisena's demographic genocide deprives Tamils of..
29.09.16 Monk sets ablaze Hindu temple as Maithiripala proc..
22.08.16 Ki'linochchi mobilizes against SL military-led Sin..
13.08.16 Ki'linochchi to mobilise against SL military erect..
09.08.16 Sinhala journalist denounces State-patronized Budd..
07.08.16 Japanese business academic opportunism eyes on Eez..
06.08.16 Sinhala military builds Buddhist vihara in Hindu t..
12.06.16 Colombo's ‘Mahaweli Authority’ chases away resettl..
03.06.16 Colombo beefs up naval installations along eastern..
21.05.16 Colombo's pompous ‘Vesak’ in North endorsed by Ind..
06.04.16 Deeper motives of Nayinaatheevu Sinhala Buddhicisa..
05.04.16 SLN intimidates Tamils to give consent for controv..
25.03.16 Role of The Netherlands abetting Colombo's cultura..
20.03.16 SL State launches ‘heritage genocide’ projects in ..
18.03.16 Colombo accelerates Sinhaliciation, Buddhicisation..
04.01.16 Uprooted Tamils demand occupying SL military to va..
25.11.15 Theravada Buddhism worse than Brahmanism in langua..
24.11.15 NPC reiterates not to change name of Nayinaa-theev..
07.11.15 Maithiripala regime accelerates Sinhala occupation..
20.07.15 Saiva shrines subjected to Sinhala Buddhicization ..
18.07.15 Buddhist military monks behind structural genocide..
23.04.15 Resettled Tamils seek empowerment to confront demo..
20.11.14 Colombo constructed 463 Buddhist viharas in 2013 i..
08.11.14 Buddhist monk appropriates Kalladi Tamil Pre-schoo..
07.11.14 Colombo attempts to seize lands of Sivan temple in..
06.06.14 SL Army conducts ‘archaeology’, The Hindu relays ‘..
03.04.14 People of Keappaa-pulavu demand Gotabhaya to hand ..
03.04.14 SL military accelerates forced ‘resettlement’ perm..
14.01.14 Bangkok Post compares BBS to violent 969 group of ..
04.01.14 Theravada Sinhala Buddhism needs further understan..
03.01.14 Global vigilance urged on ‘genocidal experiments’ ..
13.09.13 Sri Lanka archaeology claims finding ‘Sinhala Prak..
03.08.13 Sinhala military takes over Muslim cemetery at Pul..
27.07.13 Sinhala archaeology focuses operation in North-Eas..
13.06.13 Paa'nama model envisaged to Sinhalicise Ukanthai i..
12.06.13 Ampaa’rai Sinhala administration schemes Buddhicis..
11.06.13 British archaeologist makes no difference from PM ..
09.06.13 Vedda priest of Saiva temple murdered in Chella Ka..
24.04.13 Sinhala-Buddhist temple to replace Kaa’li temple i..
24.04.13 Sinhala military assaults Trinco villagers for cal..
23.04.13 Indian news magazine highlights accelerated Sinhal..
07.01.13 Documentary evidence on orders to teach Sinhala as..
04.01.13 Sri Lanka appoints military to teach Sinhala in Va..
28.12.12 Schalk tells Tamil politicians to claim territory ..
19.12.12 Simulated Buddhists, Sinhala-Buddhist schools to a..
10.11.12 Colombo appropriates lands, constructs Buddhist St..
11.10.12 JHU monks besiege historic Munneasvaram Siva templ..
03.10.12 SL military stops renovation of Hindu temple, appr..
06.05.12 Sinhala GA officially orders Buddhist construction..
19.04.12 Indian money used in Sinhalicisation, Buddhicisati..
10.09.11 Multilingualism, multiculturalism and Sinhala acad..
06.08.11 ‘Political separation needed to stop genocide in S..
22.06.11 Colombo to declare permanent ‘Sacred HSZ’ at Maath..
15.06.11 Sri Lanka Archaeology Dept plans to take Jaffna ma..
23.04.11 Germany supports Colombo’s colonial archaeology in..
26.12.10 Colombo's Archeology department intrudes into hist..
08.09.10 SL Army, Archaeology dept appropriate lands of upr..
24.08.10 Cultural and psychological attack on Tamils in Jaf..
10.04.10 Army and Archaeology Department at work in Tamil h..
02.02.10 India plays upon Buddhist emissary while monks col..
30.12.09 Heritage genocide abetted by decades of Western fu..
01.12.09 Grabbing land for wrecking contiguity of Tamil hom..
10.10.09 Sinhalese Buddhist priest appointed as archaeologi..
02.07.09 Buddhism among Tamils is quenched from two sides: ..